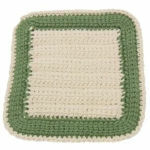 Tutti Fruiti Trivet -- $1.99 A Crochet pattern from Julie A Bolduc. This trivet is another made with an old CD. This one is best made with a CD because the center is lacy and would not protect your hands very well from hot items.